Located in the middle of Madrid, the H10 Villa de la Reina hotel occupies a building featuring the architectural style associated with the early twentieth century, though now fully renovated and restored. It has two halls for holding all kinds of events, whether for professional or for private purposes. 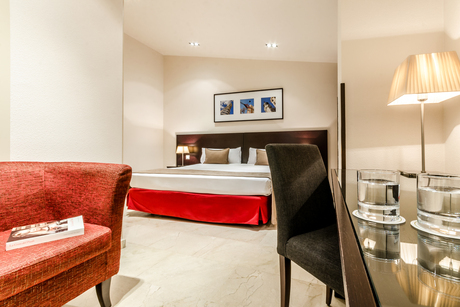 Its comfortable rooms and central location make it the perfect hotel for your visits to Madrid. Las Infantas Restaurant: with a varied breakfast buffet, including traditional confectionery, cakes and diet options. La Villa Bar: it boasts an exquisite gastronomic offer with delicious tapas and snacks The other outlet, La Villa Bar, proposes delicious tapas and snacks. Free Wi-Fi and DSL connection throughout the hotel. H10 Villa de la reina is a Boutique Hotel characterised by their exceptional location, elegant and welcoming interior design and personalised service that guarantees their guests the maximum comfort and enjoyment possible during their stay. Concierge service The rooms also include up-market details to ensure the most pleasurable stay possible: Bathrobe and slippers, Nespresso coffee machine, Mineral Water in each Room. It is located in the heart of the Salamanca district, one of the most distinguished in Madrid, within easy reach of major services and facilities and the capital's most prestigious shops and establishments. The hotel is a fine example of the traditional Vincci standards of quality, décor and style. Vincci SoMa is a perfect example of the Vincci philosophy, epitomised by its impeccable and carefully located establishments in which design, cutting edge technology, the best professional teams and the most modern hotel management techniques prevail. Vincci Soma´s own personal style and identity makes it one of Madrid's most modern and innovative hotels. 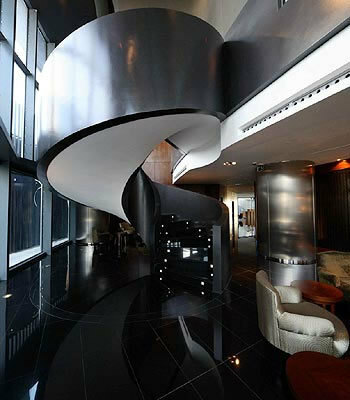 Tthe Eurostars Madrid Tower, an acclaimed, prestigious hotel has been created for clients who love exclusivity. The height makes it unique: the Eurostars Madrid Tower occupies the first 31 floors of the imposing 236-metre-tall SyV Tower. The SyV Tower was designed by the prestigious architecture studio R&AS run by Carlos Rubio and Enrique Álvarez-Sala and is part of the latest architectural, urban planning and business symbol of Madrid, the Cuatro Torres Business Area, which is also the home of the International Convention Centre of the City of Madrid (CICCM). Enjoy the spectacular views afforded by the Eurostars Madrid Tower, spanning 360 degrees from the mountains to Plaza Mayor. The majority of the hotel’s quarters (rooms, Volvoreta restaurant, Anssora Spa & Health Club and numerous meeting rooms) are veritable lookout points over the city. We have prepared the hotel to ensure that your stay in the capital of Spain is exquisite and unforgettable: walnut furniture, fine materials offering you an exclusive plus, fully equipped rooms, a pillow menu, a scenic restaurant on the 30th floor, a spa... Human warmth, friendly treatment, peerless service and concern for details are the hallmarks of our team, who will ensure your comfort throughout your entire stay. 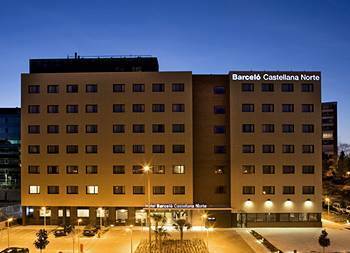 The Barcelo Castella Norte Hotel is a modern and functional newly-built hotel in Madrid, situated in the city's fastest growing business area, to the north of the Paseo de la Castellana. It is easily accessed via the main highways (A-1, M-11, M-40, M-30, and R-2) and is located just 10 minutes from the airport, 5 minutes from the Juan Carlos I Exhibition Center (IFEMA) and 3 minutes from the Corte Ingles Sanchinarro shopping center. It has 144 totally soundproof, modern, bright and comfortable rooms designed to make sure your stay is as enjoyable as possible. Rest in our King Size plus beds (210 cm) and enjoy TV LCD 26", individual air conditioning, printed press, a safe, a cybercorner and free Internet, a minibar, a laundry service and 24-hour room service, among other services. It has 3 large, open-plan meeting rooms that are partitionable and that enjoy natural light, with a capacity of up to 200 people. They are all fully equipped with the latest media and audiovisual systems as well as all the complementary services required to guarantee the success of your meetings. Locate 7 minutes by Cercanías Train from Madrid Barajas Airport (T4), from The train station Fuente de la mora, close to the hotel. Located in Madrid (Malasana), Courtyard by Marriott Madrid Princesa is a 4-minute walk from Liria Palace and 7 minutes by foot from Comillas Pontifical University. This 4-star hotel is 0.5 mi (0.8 km) from Cuartel del Conde Duque and 0.5 mi (0.8 km) from Museo Municipal de Arte Contemporaneo.Rooms Make yourself at home in one of the 423 air-conditioned rooms featuring refrigerators and flat-screen televisions. Complimentary wireless Internet access keeps you connected, and satellite programming is available for your entertainment. Private bathrooms with shower/tub combinations feature deep soaking bathtubs and complimentary toiletries. Conveniences include phones, as well as safes and desks.Amenities Be sure to enjoy recreational amenities, including an indoor pool, a sauna, and a fitness center. Additional features at this hotel include complimentary wireless Internet access, concierge services, and shopping on site.Dining Satisfy your appetite with Spanish cuisine at The Bistro, a restaurant which features a bar. Dining is also available at the coffee shop/café. Buffet breakfasts are available daily from 7 AM to 10:30 AM for a fee.Business, Other Amenities Featured amenities include a business center, dry cleaning/laundry services, and a 24-hour front desk. Self parking (subject to charges) is available onsite. The free Wi-Fi flat-panel TVs and 24-hour room service lead the list of top amenities near Madrid's IFEMA at the Barcelo Torre Arias. All 108 soundproofed rooms at the four-story Barcelo Torre Arias include free Wi-Fi flat-panel LCD TVs hairdryers and 24-hour room service. Non-smoking rooms are available. In addition to cocktails in the lobby bar guests can dine on breakfast or lunch and dinner in the restaurant during weekdays. After a workday in the business center or a workout in the gym guests can cool off in the sauna. Parking is available. The Barcelo Torre Arias is within two miles east of the Las Ventas bullring and three miles west of IFEMA. Alcala Street is less than a 10-minute walk north. Art lovers are four miles from Madrid's top museums including the Prado Reina Sofia and Thyssen-Bornemisza. Flights land at Madrid-Barajas Airport less than five miles east. The "well-decorated" rooms and on-site dining keep our guests worry-free at the Barcelo Torre Arias minutes from the Prado. 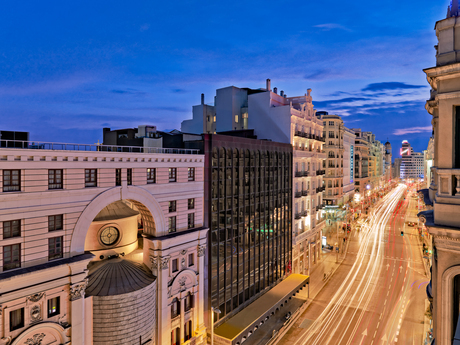 With a stay at Hotel Zenit Abeba, you'll be centrally located in Madrid, just a 3-minute walk from Avenida America and 12 minutes by foot from WiZink Center. This 4-star hotel is 0.7 mi (1.1 km) from Paseo de la Castellana and 0.7 mi (1.2 km) from Nuevo Teatro Alcala.Rooms Make yourself at home in one of the 90 air-conditioned rooms featuring minibars. Complimentary wireless Internet access is available to keep you connected. Bathrooms have showers and hair dryers. Conveniences include safes and desks, and housekeeping is provided daily.Amenities Take advantage of recreation opportunities such as a fitness center, or other amenities including complimentary wireless Internet access and concierge services.Dining Grab a bite to eat at D'aquÃ­ Restaurantes, a restaurant which features a bar, or stay in and take advantage of the room service (during limited hours). Buffet breakfasts are available daily for a fee.Business, Other Amenities Featured amenities include a business center, express check-in, and complimentary newspapers in the lobby. This hotel has 3 meeting rooms available for events. Self parking (subject to charges) is available onsite. Exe Coloso is located 50 metres from Madrid's lively Gran Via. Surrounded by great shops and restaurants this hotel offers free Wi-Fi throughout and rooms with a flat-screen satellite TV.Rooms at the Exe Coloso are modern and spacious. They feature a small seating area and air conditioning. Some rooms include a terrace.The computer in the lobby offers free internet access 24 hours a day.The Coloso's tour desk and ticket service can organize trips to nearby Alcalá de Henares and Segovia. Plaza de España and Santo Domingo Metro Stations are 200 metres from the hotel. 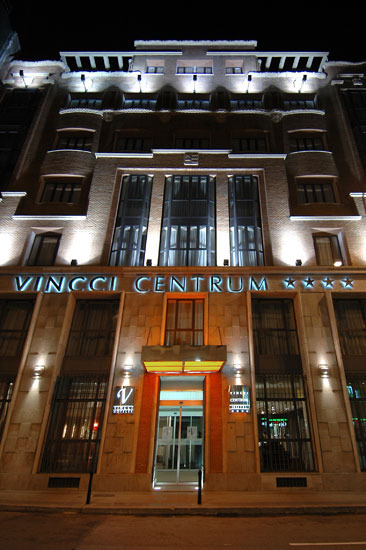 Set in a historic building the Vincci Centrum is a boutique hotel located 300 metres from Gran Via and a 10-minute walk from the famous Puerta del Sol. Rooms have a flat-screen TV and free WiFi.The Vincci maintains its original façade and features a welcoming and sophisticated décor. Its stylish and comfortable bedrooms have air conditioning a minibar and a private bathroom with a hairdryer. Some rooms feature a terrace.The on-site Bellini food&bar offers an innovative gastronomic concept including signature tapas and a selection of wines and cocktails. A varied buffet breakfast is available every morning including special products for celiacs. 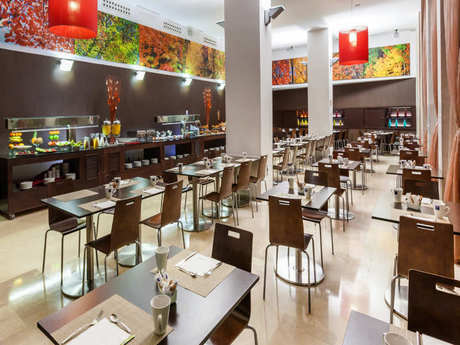 Guests can enjoy a drink in the lounge bar where there is a selection of national and international newspapers.The Centrum is set within the artistic triangle of Madrid comprised by the Prado Thyssen and Reina Sofia Museums. The hotel is less than 1 km from Retiro Park and Madrid's Atocha Train Station is a 20-minute walk from the hotel. Barajas Airport is around 12 km away. Private parking is available for an additional cost at a location nearby.Shops bars and restaurants can be found in the surrounding Chueca and Gran Vía districts. 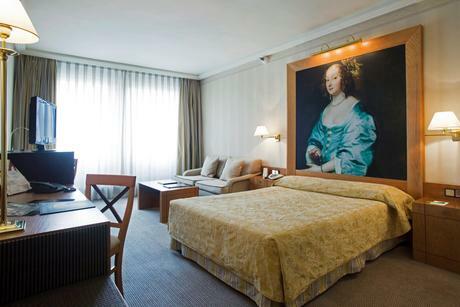 The Thyssen-Bornemisza Prado and Reina Sofía museums are within 20 minutes' walk of the hotel. 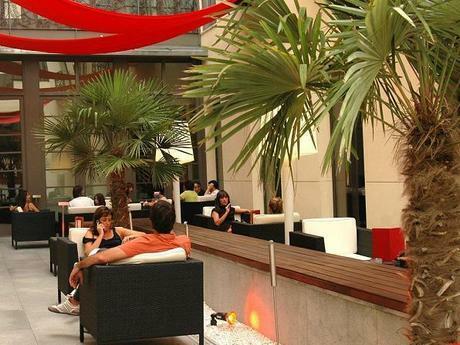 Situated on Madrid's Paseo Castellana Hesperia Madrid offers free Wi-Fi. The hotel's stylish Santceloni restaurant has been awarded 2 Michelin stars.The elegant rooms at the Hesperia Madrid include flat-screen satellite TV a Nespresso coffee machine a pillow menu and luxury amenities. Room service is available 24 hours a day.In addition to the Santceloni the La Manzana restaurant serves creative Spanish cuisine in a bright interior courtyard. The Hesperia also has a Japanese restaurant Hikari Sushi Bar and a Scotch bar that offers over 70 different whiskeys. A healthy breakfast is also offered.There is an on-site fitness room and an open-air SkyGym located on the hotel roof and offering impressive views of Madrid.Hesperia Madrid is located opposite the National Natural History Museum and less than 2 km from the Bernabéu Stadium and many designer shops. Gregorio Marañón Metro Station is 50 metres away while direct airport trains stop at Nuevos Ministerios Station within a 10-minute walk. 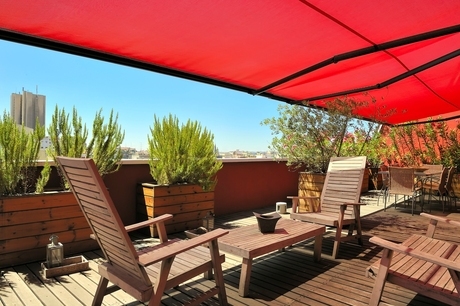 Suites 33 is located in the Barrio de Palacio, right in the heart of Madrid, and no more than five minutes away from the Palacio Real, Plaza de Callao, the popular Preciados street, Puerta del Sol, the Opera theatre, Plaza de España and Plaza Mayor, among other must-see places. There is no restaurant in the hotel, but our staff will be pleased to recommend the best eateries in the zone, depending on the kind of food you fancy. The hotel rooms are spacious, comfortable and equipped with a plasma TV, free Wi-Fi, mini-bar and air conditioning. Some rooms also have a terrace. Parking: The hotel has a limited number of parking spaces arranged a private indoor parking located 100 meters from the hotel. The parking spaces are subject to availability and no parking reservations are made. Upon arrival at the hotel reception will indicate availability, how to access and prior deposit of 10 € will hand over the key to access. Upon leaving the parking will have to return the key for the return of the deposit delivered.Indoor parking fee (23 € / day).Access to the hotel: The hotel is located on Calle Leganitos being a street in an area Priority Area Residential (Zone: Opera) established by the City of Madrid. So, if you access vehicle to the hotel note that to avoid fines you to inform the reception of the vehicle registration you have accessed the street and / or days that such registration will transit shall be the street during your stay so that it be reported to the City of Madrid and avoid fines. The hotel shall not be liable for such penalties for failing to report correctly in a timely manner the necessary information. Superb hotel built in 2006, made up of five buildings, all cultural heritage sites, whose facades angle around the main streets of Prado-Leon and Leon-Cervantes. All five centrally located buildings have been completely renovated. 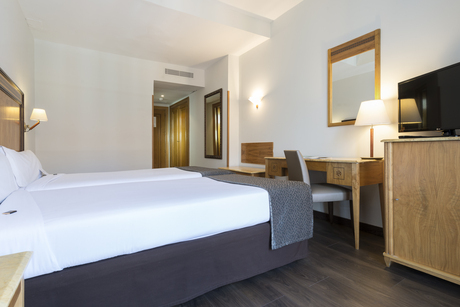 This new hotel is one of the most modern hotels of the city and is located in the famous "Barrio de Las Letras", just a few steps from the Plaza de Santa Ana and the Puerta del Sol. It also offers very easy communication with any part of the city by tube, station Sevilla (line 2) and station Sol (lines 1 and 2) wich are located at 200 and 300 meters respectively. Located in the heart of the historic center of the city, and conceived as a modern and innovative hotel it combines Zen aesthetic with a cosmopolitan atmosphere worthy of New York, whilst also respecting the history of the buildings (including stairs and palm trees, declared as national heritage)Located in the heart of the historic center of the city, whithin walking distance from the socall "Triangle of Art" formed by the city´s main museums (El Prado, Reina Sofia Modern Art Museum and Thyssen Bornemitza contemporaneous art museum) The hotel offers 169 design rooms all equipped with individual air conditioning/heating, direct telephone, satellite TV, minibar, room service, safety box, hair dryer, internet conection and a complete amenities set. The hotel also has an a la carte restaurant with day menu and buffet brealfast with terrace, bar - cafeteria, wide common areas, an inside patio, outside terrace with garden, private garage and meeting facilities.